There are two ways to experience Mocha Fest Jamaica. You can either purchase a party pass, which gives you access to our 8 Super parties, held over the 5 days. The people that do this are normally those that have secured their own accommodations and airport transfers. The second way is to book our hotel plus party pass package, which gives you a spot on one of our designated host resorts. Even though Mocha Fest is an incredible experience regardless of which one of those options you choose, there is no doubt that those that stay at our host resorts, get to add another to dimension their vacation that is just not possible to create elsewhere. To help you with making your decision on whether you choose to book our host resort package or not, here are 5 benefits you get from booking our hotel plus party package. The party is never really over when it’s over. When we shut off the lights at our super parties, those staying at our host resorts get to go back to their hotel with hundreds of people, still ready to continue the party at the hotel pool or nightclub. The hotels are normally sold out during Mocha Fest, so if you are not booked at one of these hotels, there is no way to get access to the resort and therefore no way for you to participate in any of the parties happening onsite without having a reservation. You can literally double the amount of partying you do at Mocha Fest by staying at one of our host resorts. One of the biggest reasons Mocha Fest has such a high percentage of repeat attendees is due to the relationships and friendships they get to create while at the event. This is mainly true for those booked into one of the host resorts. You get to have meals at the restaurants, hang out at the pool, hook up after the parties even with the people you are partying with. You also get the benefit of meeting and getting to know the Mocha Fest team members, including hostesses, organisers and our Celebrity guests as they also stay at the host resorts. All our host resorts are conveniently located within 5-10 mins of our party locations. A shuttle bus is always outside your hotel lobby waiting to take you to the next party, and you are usually the first to get dropped off when the party is over. When you book our hotel plus party package, we also help arrange your transfers to and from your airport, and a Mocha Fest staff member is always stationed in the lobbies to answer questions or to help with solving problems when necessary. We all know what happens immediately after leaving a party where you were dancing, drinking and probably smoking for 4 to 5 hours. You’ll most likely show up to your hotel hungry at 3:00 am in the morning. We ensure our host resorts have food ready and available until the wee hours of the morning, to help satisfy those midnight munchies that will most certainly show up every single night while at Mocha Fest. Get this room for #mochafestjamaica!! They are moving fast so secure urs with a deposit of $250 per person. 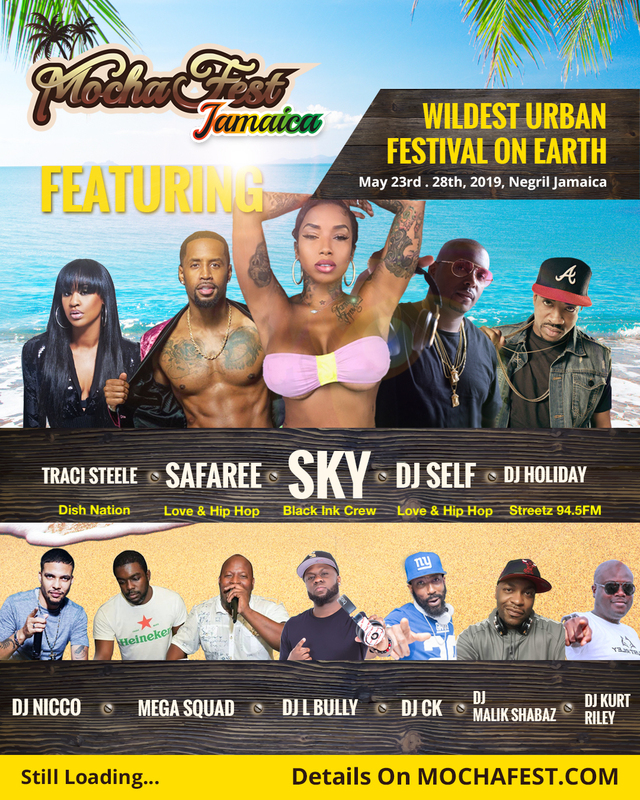 Go to MOCHAFEST.COM and book Ur room at HideAway By Royalton for #mochafestjamaica. Apart from the fact that we do not charge you anything more for your hotel package than what you would pay the hotel directly, we also include a discount on the purchase of your party pass as well, if you book hotel with us. We also have special items that go in the gifts bags that are exclusively for our hotel guests. We also ensure that any resort we choose as a host resort offers an atmosphere that is more than just room and board. If you have already booked your own hotel packages, if you have friends or relatives that you are staying with locally, or if you are just doing an Airbnb with friends and all you want to do is purchase the party pass, there is nothing wrong with that as you will still have an exceptional time at our super parties. However, there is no doubt in my mind that if you stay at one of our host resorts for Mocha Fest Jamaica, you are in for an even more epic experience.